Embargoes and NDAs are bad enough. The presumptive embargo is worse: where you send embargoed information along with the embargo notice, without first making sure your recipient will agree to honor the embargo at all. But look! Here’s a new way to screw up: Burying the presumptive embargo way down in in the email signature. And not having a time on it, either. Please note: all information contained in this email is embargoed until Wednesday, January 25th, 2012. Seriously, this is a recipe for a busted NDA and bunch of unhappy clients and journalists. So I’ll just sit back and watch this one explode. Thanks anyway. If you tell me your company is in “stealth mode,” it should take more than ten seconds with Google to find out everything about it. I’m looking at you, Demo presenters. If you send an unsolicited email with an embargoed press release in it, we consider that fair game to cover immediately. Get your NDAs agreed to before you send them. 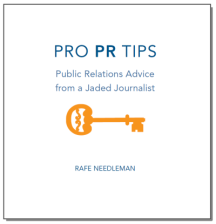 This concludes NDA Week on Pro PR Tips. We will return to regular programming Monday. You might be able to tell me when I can write, but you don’t get to tell me what. Pro PR Tips management hopes you are enjoying NDA Week. We conclude tomorow. I busted your NDA? Sorry sorry sorry a million times sorry. It’s still NDA Week at Pro PR Tips. More tomorrow.